3 “The Weather” monsters When your opponent would Special Summon a monster(s) (Quick Effect): You can send this Link Summoned card to the GY; negate the Summon, and if you do, destroy that monster(s). Once per turn, during the Standby Phase of the turn after this card was banished from the field to activate a “The Weather” card’s effect: You can Special Summon this banished card. “The Weather” Effect Monsters this card points to gain the following effect. ● When a card or effect is activated (Quick Effect): You can banish this card; negate the activation, and if you do, destroy that card. We end this week with The Weather Painter Link Monster that I referred to this week, Rainbow. Rainbow is a Link-3 requiring exactly 3 The Weather monsters, which can come back to bite in case we ever get a Link-2 The Weather Link. You can send Rainbow to the GY to negate the summon of a monster and destroy it, this is a quick effect. Nice summon negation, reminds me of Thunder King Rai-Oh. It has the Special Summon effect all of the Weather monsters have, banish it to activate the effect of a The Weather card and summon it during the next Standby Phase. Also, Rainbow gives The Weather monsters she points to the effect that they can be banished to negate a card or effect and then destroys that same card. 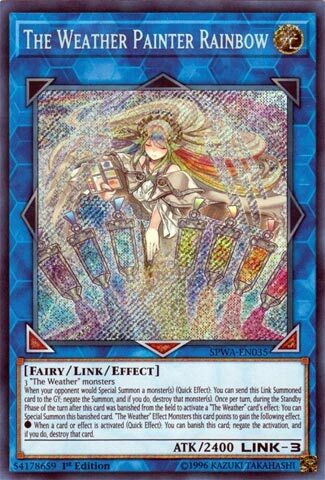 Negation is a nice thing to have in The Weather deck, but it would of been much better to have on a Canvas card than a Link-3. At least she points Bottom Left, Bottom, and Bottom Right. If you are controlling the tempo of the game to where your opponent is struggling and you have a full field, which isn’t the hardest if you are controlling the game with this deck, as I said this week, you can summon this to put the nail in the coffin. Solid card, just wish it was easier to summon as well as having a few of The Weather monsters on the field.